While then Deputy Prime Minister and Minister for Agriculture and Water Barnaby Joyce was busy building up his "private" media brand enough to rival the Kardashians, under his watch, management of the Murray-Darling Basin was steadily careering out of control. Back in August 2018, the Productivity Commission completed a review of the $13 billion Murray-Darling Basin Plan’s governance entitled, 'Murray-Darling Basin Plan: Five-year assessment'. An immediate improvement is nevertheless required in two important elements of the Plan. This is an opportunity to make important "stitch in time" changes to ensure an effective Plan. Failure will be costly for the environment and tax-payers and undermine confidence that the significant investment in the Basin Plan has been worthwhile. It doesn't appear as though any of this advice was heeded in the months leading up to the fish kill disaster. As well, serious allegations that Joyce signed off on unsecured water purchases known as “ghost water” transactions at inflated prices – which provided large irrigators, such as agribusiness big irrigator and $300 million water portfolio owner, Webster Limited, huge profits – remain unanswered. Back in June 2017, IA published an investigative report from Mark Zanker, 'The Murray-Darling Basin: Water, markets and money', which indicated an exorbitant overpayment for water in Tandou and Menindee. It prompted a sharp dressing down and request from the Department of Agriculture that IA remove the article on the grounds it was 'inaccurate'. Since the Department did not provide further information about these alleged inaccuracies, however, we did not take Mark's well-researched article down. The price of the sale was not mentioned in the media release, but the ABC reported that Tandou stated that it would receive $78 million from the transaction. That would be used by Tandou (Webster Limited) to retire debt. The ABC interviewed Tom Rooney, one of the founding directors of the water broking firm Waterfind Australia, based in Adelaide. He was asked for his assessment of the price paid and whether the deal was a good one for Webster Ltd. Rooney described the deal as a “fantastic deal” for Webster. The reason for that was that the purchase price paid by the Commonwealth was, roughly, $3,500 per megalitre, whereas the running average price of water in the Lower Darling traded on the water market over recent years was $140 per megalitre. It's like a giant neon emergency signal flashing across the four most populous states in the country. Depleted, despoiled, often poisonous and since 2001 frequently dry, the Darling River is an emblem of poor government, mismanagement, greed and anti-democratic activity. As was reported last month, that deal – personally negotiated by Barnaby Joyce – was at more than twice the market price for water. That’s $112 million of taxpayer funds to one station, Tandou. Webster Limited has owned Tandou since 2015. The company also owns several large cotton properties upstream at Bourke and Moree. Scratching around for something to point his incompetent fingers at after the mass fish deaths disaster, Minister for Agriculture and Water Resources and Minister Assisting the Prime Minister for Drought Preparation and Response, David Littleproud, blamed it on the drought, calling it a "natural event". “The Nats are plagued by scandal, vested with bullies and riddled with incompetence ... The one thing they were supposed to be good at were [sic] looking after farmers and they have failed at that. 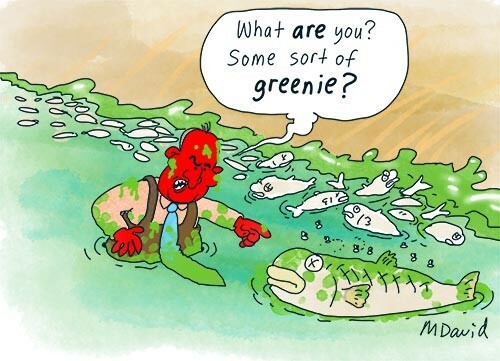 Look at the management of the Murray-Darling." Indeed. Back to you then, Mr Littleproud and Mr Joyce. Prime Minister Morrison tried to argue that despite the "devasting ecological event", the Government had been "operating in accordance with scientific evidence" provided back in 2012 — except it has not. Actually, the plan IGNORED the advice from scientists, who warned that this would happen. But all of this, of course, does not mean that anything will change anytime soon and, if past "achievements" are anything to go by, the gross mismanagement of the Murray-Darling Basin, upon which the livelihood of so many depends, will continue.